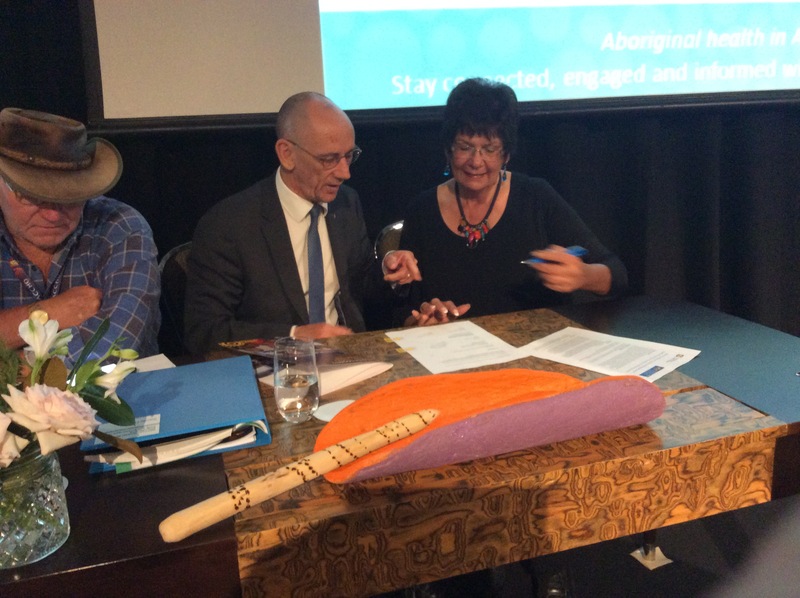 The National Aboriginal Community Controlled Health Organisation and the Pharmacy Guild of Australia have signed a Memorandum of Understanding focusing on the implementation of Aboriginal and Torres Strait Islander pharmacy programs and trials. NACCHO and the Guild said the MoU is built on the welcome initiatives already announced by the Government under the Sixth Community Pharmacy Agreement’s Pharmacy Trial Program (Tranche 1 and 2 projects), including improved medication management for Aboriginal and Torres Strait Islanders through community pharmacist advice and culturally appropriate services. The MoU strengthens the joint commitment between NACCHO and the Guild to work with Minister Hunt towards progressing enhancement in these areas. The National President of the Pharmacy Guild, George Tambassis, said the MoU was an important step in improving the health of Aboriginal and Torres Strait Islander communities throughout Australia. “Community pharmacies provide very accessible services and in remote and rural areas the community pharmacists may be the only health professional available. Further developing and improving the delivery of Aboriginal and Torres Strait Islander programs provided through community pharmacies is a welcome boost in the delivery of healthcare to these communities,” he said. Pat Turner CEO of NACCHO acknowledged the extensive effort and resources that both organisations contributed to improve medicine and pharmacy policy over the last 18 months for Aboriginal people. 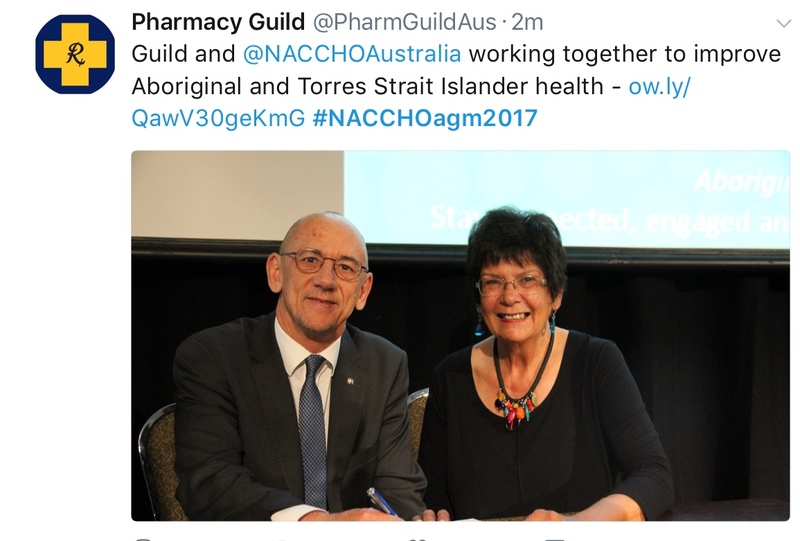 “We are delighted that the Guild and NACCHO will be working together with Minister Hunt to continue the Indigenous pharmacy programs and to adopt a number of recommendations that will improve accessibility to medicines for our people to help Close the Gap” she said. • Addressing Closing The Gap (CTG) prescription annotation issues to allow hospital prescribers and specialists to issue CTG prescriptions, community pharmacies to annotate scripts if patients are known to be eligible, and allowing all Aboriginal Community Controlled Health Organisations (ACCHOs) to write CTG scripts. • Linking CTG eligibility in a nationally accessible identifier, such as through clients’ Medicare numbers, and removing geographical constraints related to CTG. • Allowing CTG prescriptions to be written by prescribers who have not completed the Practice Incentives Payment – Indigenous Health Incentive in some circumstances to improve medicines access. • Removing the exemption of s100 highly specialised drugs from the CTG measure, such as clozapine and HIV medication. • Funding of Dose Administration Aids (DAA) as part of the CTG PBS measure along the lines of the model already in place with the Department of Veterans’ Affairs. • Establishment of a national consultative body to provide guidance on issues with the aim of improving pharmacy services and programs for Aboriginal and Torres Strait Islander people. This measure would include looking at expanding Quality Use of Medicines services and ensuring that all ACCHOs (including remote) have access to the Quality Use of Medicines Maximised for Aboriginal & Torres Strait Islander People (QUMAX) program through partnerships with community pharmacies. • Supporting a streamlined method for expanding the PBS listing for Aboriginal and Torres Strait Islander people, for example through a national consultative body. • Amendment of the Integrated Team Care program (ITC) national guidelines to ensure that ACCHOs receiving subsidised DAAs under the QUMAX program are not excluded from receiving funds for DAAs from the Integrated Team Care Program for clients who do not receive QUMAX DAA subsidy.